Jim Centore, group lead for orbital mission operations at Blue Origin, has said the company started to run tests on its BE-4 rocket engine in October 2017 at its facility in West Texas and will continue the testing phase over the next several months, SpaceNews reported Saturday. “We’re getting longer duration burn times. We’re going though validating the turbomachinery very closely,” Centore said Wednesday during a panel discussion at the 45th Space Congress in Florida. BE-4 is designed to run on liquid oxygen and methane and is being developed by Blue Origin for its New Glenn rocket. United Launch Alliance considers BE-4 engine and Aerojet Rocketdyne’s liquid oxygen/kerosene-based engine AR1 for possible integration with the Vulcan rocket’s first stage. 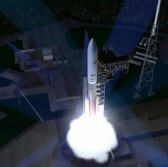 Gary Wentz, vice president for government and commercial programs at ULA, said the Boeing–Lockheed Martin joint venture is on track to launch its Vulcan rocket by mid-2020 but has not yet selected its preferred engine for the vehicle. The U.S. Air Force awarded Blue Origin and Aerojet Rocketdyne in 2016 separate “other transaction” agreements worth $161.9 million combined to build rocket engine prototypes under the service branch’s Evolved Expendable Launch Vehicle program.